I do love to try rare and unusual varieties of vegetables and the I'itoi onion (pronounced E-toy) is a rarity. It has been grown by the Tohono O'odham people in the Southwest but it isn't actually native to the Americas, rather it was introduced by the Spanish in the late 17th century. From what I've read the onion was not commercially grown until fairly recently, it was kept going in the obscurity of home gardens. It is still not widely grown but seems to be slowly developing a devoted following. Slow Foods has included it in its Ark of Taste, which is their collection of distinctive foods that they consider to be in danger of being lost. I think it's a shame that it's not better known. This is a gem of an onion. It's a survivor, having adapted to desert conditions over the course of over 300 years. Yet it seemed to thrive in the more pampered conditions of my mild climate, well amended soil, and regular water. That ability to survive was quite evident from my experience with starting them. I ordered 10 bulbs from Native Seeds/SEARCH very late last fall, apparently at the very end of the season because the bulbs that I received were incredibly shriveled up and seemingly lifeless. I planted the bulbs anyway since some of them seemed to have a bit of substance left in them. I wasn't going to take any chances on putting them directly into the garden though so I planted each tiny bulb into it's own individual 3-inch pot. So I was absolutely amazed when 7 of the 10 bulbs sprouted. And then, grrr, I lost 2 of them when some critter dug into the pots. Then I was down to 5 plants. Oh well, I was still willing to give them a chance, although I wasn't going to give them any significant garden space. But then, as plants seem to do in the spring, they really started to take off. These are "multiplier" onions, 1 onion splits into 2, then those 2 turn into 4, 4 into 8, 8 into 16, and so on.... Then I really started to pay attention to them! That clump above started with a single onion that produced 1 sprout. You can get an idea of how the process goes in the photo above. 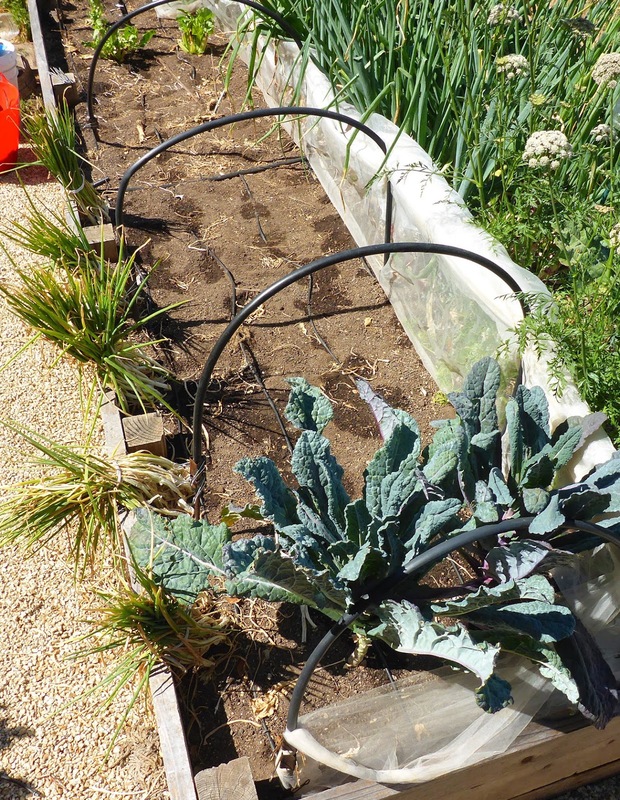 I wonder what the plants would have been capable of if they hadn't been squeezed in along the side of the bed and nearly overshadowed by the cabbages on the other side. The green tops start to die back in the summer and that's the time to lift the plants and cure the bulbs. Although, I have read that they can be kept in the ground and allowed to regrow which should start in late summer or fall. Since I didn't put the plants in an ideal location I chose not to experiment with that and lifted all of them. That's one of the clumps photographed after I cleared away some of the soil and just before I lifted it. And there's that same clump separated into individual onions or clumps of 2 or 3. Wow, all that from 1 little desiccated bulb. I'm sure there would have been even more if I had planted them in September or October rather than December. I tied each clump into individual bundles to cure so I could see how much each one produced. Rather than trying to count each individual bulb I just weighed the cleaned and trimmed onions. So there was a range of yields from each clump - 16.1, 13.1, 9.6, 7.6, 6.4 ounces each for a total of 52.8 ounces - or 3.3 pounds! I'm not complaining considering what I started with. I set aside 6 bulbs from each clump for planting in the garden. I have space opening up soon so I'll try a very early start this year. The bulbs were actually ready to be cleaned earlier but I just didn't get around to it and if I hadn't been interested in keeping track of the production of the individual clumps I would have just started using them as soon as I lifted them. I can't wait to see what's in store for me for the 2016/17 growing season. With an earlier start and more space per plant I hope to get a more generous yield next year. And with more plants I'll get to sample them while they are still young. The green tops are supposed to be an interesting substitute for chives so I may grow a few in pots just for trimming the tops. 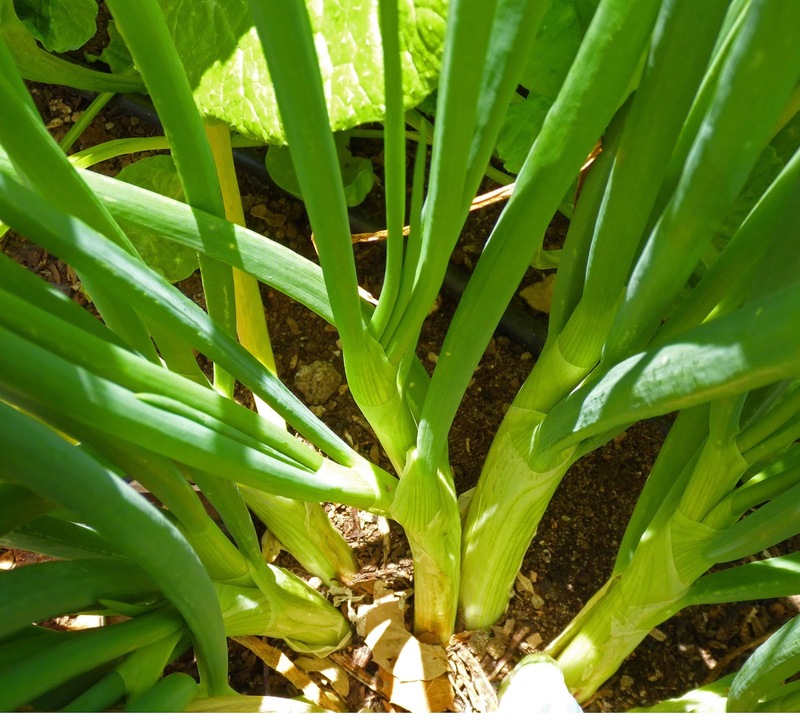 These should grow through the winter, unlike chives which go dormant, so it will be nice to have some spicy onion tops to liven up winter dishes. Now is the time to buy them if you want to grow them. Seed onions are currently available from Native Seeds/SEARCH. Baker Creek has them in their offerings but doesn't seem to have them in stock at the moment but probably will soon. And it looks like Crooked Sky Farms also offers them, they seem to be Baker Creek's supplier. 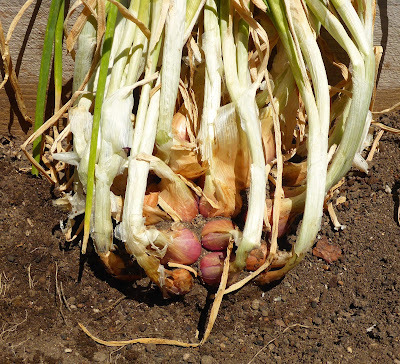 Check out Crooked Sky Farms story about their experience with I'itoi onions, it is very similar to mine, they started with a few shriveled bulbs also and are now growing literally tons of them. They also have some growing tips there that I'm not going to repeat. Thanks for doing a spotlight on this rare allium. I ordered some from Native Seeds/SEARCH back in July right after you dug yours. The bulbs I got look great, good enough to eat really, but I resisted the urge. They look like little shallots to me. 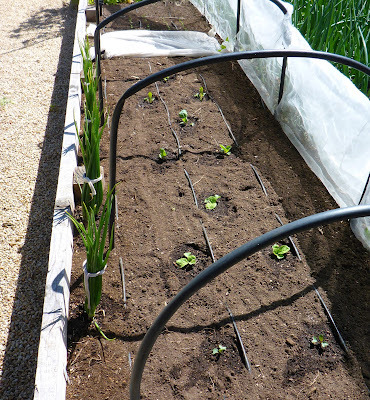 I'm going to plant mine with my garlic, which is usually in early November here. I am looking forward to the multiplier effect! They are very much like shallots and that's how I intend to use them. It will be very interesting to see how they do in your cold winter climate, I didn't run across any comments or information about growing them in cold climates when I was trying to learn a little more about them. I will try some in the open garden and a few in the greenhouse as well. It looks like they might be marginally hardy in our climate. We shall see! They might need to be spring planted here. What a terrific history and such great production from what you planted. I love the idea of a "multipler" onion - not sure if I've seen anything similar (other than Egyptian walking onions, but not quite the same thing). I don't know of any other multiplier onion. Bunching onions are similar in the way they multiply, but the ones that I've grown didn't multiply with the generosity of the I'itoi, nor did they form bulbs. And the bunching onions I've grown have bloomed and that's supposed to be quite rare for the I'itoi. This really seems to be a unique allium. A great result from a very unpromising beginning. The way you describe them multiplying is just like shallots - splitting and re-splitting. You say that you are going to give them a better spot in the garden next year, but I wouldn't be all that surprised to hear that they don't do so well. Some plants thrive on adversity, and this might be one of them, considering its history! Your harvest looks a lot nicer than the photo on the Baker Creek site (BTW their supplier is Pinnacle Farms in AZ). I guess the next question is how long will they store. For Dave, BC has a reviewer from Minnesota who has grown them 3 years in a row so Indiana should be OK. I have an order in for potato onions, another multiplier onion that forms bulbs, from Southern Exposure, which I will try this fall. They claim they keep 8-12 months. Their photo shows better looking bulbs than what I started with! So I guess there's more than one commercial grower of these onions now. So far as storage time goes, that remains to be seen. 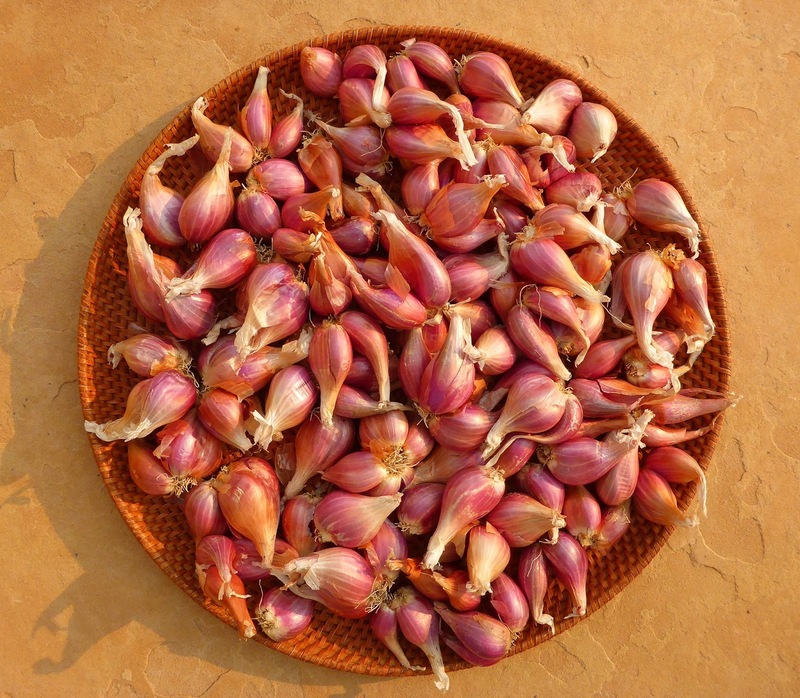 If they keep like shallots they could last a long time, the seed grown Zebrune shallots that I've been growing can keep for more than a year. I'm still finishing off the ones I grew last year. And it's good to know about their adaptability to cold climates. It seems like a common complaint with little onions like this is peeling them. The easiest way that I've found to peel them is to soak them in some warm water for a few minutes, that softens the dry skins and makes it easier to pull them off. Works with garlic too.